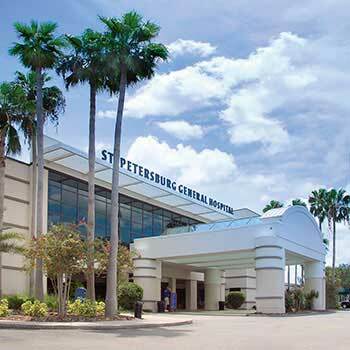 St. Petersburg General Hospital is a Joint Commission accredited full-service 215-bed acute care facility, providing comprehensive emergency, diagnostic, medical, surgical and women’s services including labor and delivery, post-partum and nursery. St Petersburg General Hospital is a designated Blue Distinction Center + for Maternity Care; accredited as a Breast Center with Digital Imaging and Computer Aided Detection; Chest Pain Center; Certified Advanced Primary Stroke and AFib Center; Accredited Cancer Center and a GYN Robotic Surgery Training Epicenter. Other services include The Pelvic Pain and Incontinence Center and The Orthopedic Center for Joint Replacement and Spine Surgery.